To enjoy Cancun at its best, you need to spend more than a couple of days there; however, this is not always possible and you have to make sure you see and do the most you can. To help you, we share with you a perfect plan for a weekend in Cancun. If you want to enjoy aquatic activities, gastronomy and culture, this itinerary is perfect for you. Get up early and take a very energizing breakfast of local dishes, so you have plenty of time for the day’s activities. 10:30 am: by this time, you must be ready for a unique experience: swimming with dolphins in Cancun. Where can you do that? 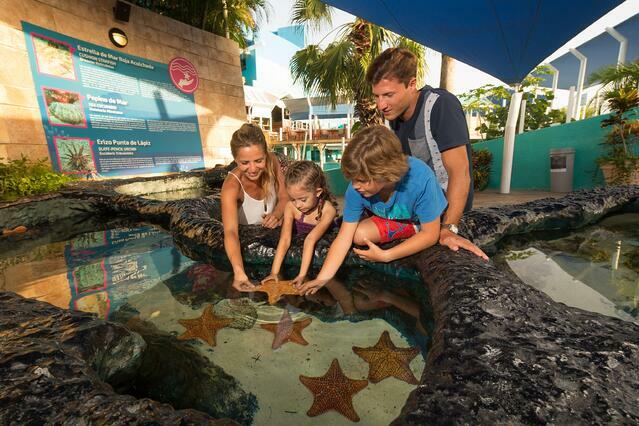 Visit the Cancun Interactive Aquarium, located in the hotel area, and live a fantastic adventure! TIP: book your swim in advance to ensure you get the most convenient time slot. 12:00 pm: after swimming with dolphins, you can take a tour in the Aquarium, where you will learn a lot about the more than 1,195 species that you will discover, see and even touch. 1:00 pm: walk around La Isla shopping center, an amazing place to shop and buy the most prestigious brands. Besides, it is located outdoors, so you will enjoy the stores and the beauty of the Nichupté Lagoon. 2:00 pm: you will probably be hungry by then, so we suggest you go for lunch at the Thai restaurant, which has beautiful views of the Lagoon. Its menu and environment are ideal for picking up energy and keeping the adventure going. 3:30 pm: your day will get better and better when you visit the Mayan Museum of Cancun, which closes at 5:30 pm, so you will have plenty of time to see the most important remains of the Mayan culture. 6:00 pm: we suggest you go back to the Nichupté Lagoon to see the sunset. It’s a show that will take your breath away and end a perfect day in Cancun. It’s worth spending a moment there just appreciating nature. 7:00 pm: after all that walking, you will be hungry again, and if you go for dinner at Fonda del Zancudo, you won’t regret it. This restaurant is not located in the touristic area but the dishes are delicious and the service is exceptional. Your second day will begin very early, so make sure your energy levels are high! 8:00 am: this day starts at Hacienda Sisal, the best place to enjoy Mexican cuisine in Cancun. You can choose pozole, cochinita pibil, chilaquiles or tacos with hand-made tortillas. Just remember to keep some space for dessert. 9:30 am: go to one of the most beautiful beaches in the country, Puerto Morelos, just 40 minutes away from Cancun. Puerto Morelos is a quiet fishing port, where you can try plenty different aquatic activities like diving, snorkeling or swimming with dolphins, if you didn’t find the time to try it in Cancun. Or you can just rest on the white sand in this area of the Mexican Caribbean. 3:30 pm: go back to Cancun and eat in one of the best restaurants in the city: Puerto Madero. This place is the highest rated by its visitors. Placed on the edge of the Nichupté Lagoon, it has a spectacular view, service and food that will wake up your senses. 5:30 pm: just 20 minutes away from Puerto Madero, you will find one of the best places to see the sunset in Cancun: the Malecon Tajamar. If you want to finish your second day in a perfect way, go there and walk along the pier. You won’t regret it. Are you ready to spend at least one weekend in this paradisiac destination? Don’t think about it too much and enjoy diving, eating and swimming with dolphins in Cancun as soon as you have the chance!